The Other 99 T.Y.M.E.S by Carlos Wallace, published by Million Dollar Pen, Ink. Any experience can make or break the way you view life. The choice is yours. Sometime, we spend so much time focusing on the one thing that went wrong, we lose sight of the 99 other times things went right. Ralph Waldo Emerson once said that in order to achieve contentment, one should "cultivate the habit of being grateful for every good thing that comes to you, and to give thanks continuously." Researchers have found that the act of counting one’s blessings actually helps strengthen relationships, in all forms. In “The Other 99 T.Y.M.E.S” the undervalued concept of gratitude is the critical theme which defines the groundbreaking sophomore narrative by Carlos Wallace, author of the bestseller “Life Is Not Complicated, You Are.” This may all be an enigmatic concept for some to grasp; the realization that although you have hit some rough patches the experiences should never negate moments that a kind word, a caring act, an instance of forgiveness or the rewarding feeling of knowing you worked hard to achieve a goal brought you satisfaction and made you happy. This book will teach you to appreciate the good in your life and encourage you to maintain a positive attitude despite the negativity that surrounds you. To appreciate circumstances that help you evolve not because you are impervious to pain and disappointment, but because you are accepting of joy. Most importantly, “The Other 99 T.Y.M.E.S” will help readers summon up the courage to approach life with an open mind, eyes wide open. You will no longer turn a blind eye to your struggles, hoping they will fade away if they are ignored. Ignorance is a progressive thinker’s enemy; acceptance, awareness, accountability and action are the tools of the informed; of people who want change and do all they can to achieve it. The book, much like “Life Is Not Complicated, You Are” is an odyssey into recesses of your psyche that you may not have fully tapped into. At the end of the journey, prepare to view life through a completely different lens. 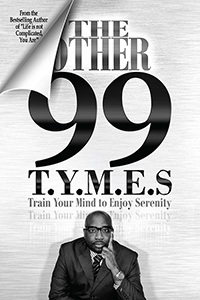 Prepare to appreciate and value “The Other 99 T.Y.M.E.S”. Carlos Wallace is a man undeterred by life’s challenges. This in no way suggests he is superhuman. The Professor, Businessman, Psi Beta Honor Society member and Philanthropist has honed the ability to view a complex life from the lens of a positive thinker, despite a life marked by tragedy. Years of professional and personal experience helps him teach others how to manage their emotions in order to minimize negative perceptions. Carlos is a dedicated father and community leader spends time between homes in Houston and New York. © 2019 Million Dollar Pen, Ink.. All Rights Reserved.